Russian billionaire and presidential candidate Mikhail Prokhorov on Monday unveiled plans to build the second hybrid Yo-mobile plant in the Russian Far East. 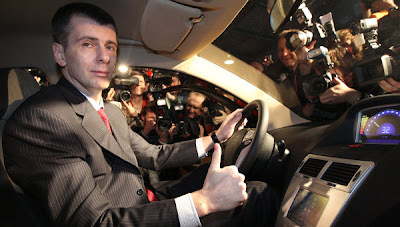 Russia's Yo-Auto plant, co-owned by Prokhorov, is expected to offer its first Yo-mobile hybrid cars for sale in December 2012. The annual production capacity of the first Yo-mobile plant near St. Petersburg is estimated at 45,000 cars. Capacity will be doubled after the second stage of the plant is built. Prokhorov has said he wants to make a unique eco-friendly hybrid car that would cost less than $10,000.